All posts tagged with "portal site puts your ticket in a jar and flies it to pluto"
It’s been an exciting week! 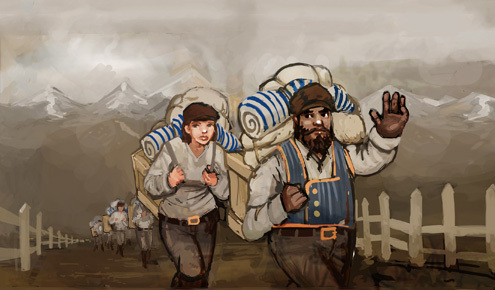 On July 16 we launched sales for “Earliest Access” to Clockwork Empires, then on July 18 we distributed the game to the public for the first time. It may not be our first time at the rodeo but it’ll always be scary to launch a game after keeping it hidden away (for over two years, in this case). It’s all gone really well! There were a lot of parts that we needed to test in the real world instead of sitting on private servers and this goes not only the game content itself, but our distribution and payment partners as well as our supporting websites. As Nwabudike Morgan put it, “Each interdependent piece must be materialized simultaneously and in perfect working order.” That’s pretty much what happened and we had a smooth launch; go team! People are buying the game and are having fun with fishpeople, starvation, and building stuff. People are finding all kinds of fascinating bugs and telling us how we should make the game better. We sent out a hotfix yesterday, rev27C — changelog at the end of the post — which fixed more than a few things, and we are now fixing a bunch more stuff and putting together some new content for the next update which should be coming early next week. (We had to delay the hotfix by a day because you guys found so many Fun and Interesting bugs.) Special props go out to Dienes for telling us how we really ought to fix this or that script error before we even get a chance to look at the bug reports. We’re also figuring out how to best communicate with fans, working out how to keep up a rapid pace of iteration, developing new features, and maintaining an active dialog about the game going in the forums.